Dmitri Hvorostovsky brought us to tears twice. Once when he sang Rodrigo in Verdi's Don Carlo at the Met, and once when he died prematurely. Honoring this legendary baritone was such a splendid idea! 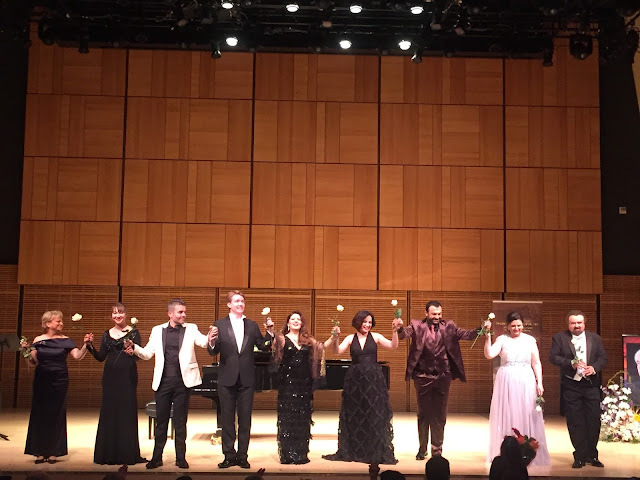 In a recital produced by Talents of the World at Zankel Hall last night, his friends and colleagues from all over the world joined together onstage for a generous program of operatic arias, Neapolitan songs, and Russian romances. Baritone David Gvinianidze, president and founder of Talents of the World is much honored and also beloved from his hosting a TV show in his native Georgia. He took it upon himself to sing the aforementioned aria "O Carlo, ascolta...Io morró", which must have been even more emotional for him than for us. A duet from the same opera--"Dio, che nell'alma infondere" was sung in perfect harmony by tenor Raúl Melo (who actually sang this duet with Hvorostovsky) as the eponymous Don Carlo, and baritone Oleksandr Kyreiev taking the role of Rodrigo. In a long and varied program such as this, we get the opportunity to hear singers in a variety of roles and languages. We have to say that we enjoyed Mr. Melo the most when he sang opposite another singer. For example, his duet with mezzo-soprano Nino Surguladze--the final scene from Bizet's Carmen--was riveting, not just vocally but dramatically. We believed every horrifying moment, even minus sets and costumes. We enjoyed this more than his solo song--Leoncavallo's "Mattinata" in which he performed for the audience rather than getting the message of the song across. Regarding Mr. Kyreiev, we enjoyed him most when he sang in his native tongue. The song was not on the printed program so we were unable to identify it but there was no mistaking Mr. Kyreiev's ease, which allowed the timbre of his voice to be appreciated, along with variety of color and dynamics. His voice blended well with others but his solo aria "O Vin Dissipe la Tristesse" from Ambroise Thomas' Hamlet seemed unidimensional and needed more variety. What singer does not love a good drinking song! It's the operatic equivalent of an actor's death scene. He could do so much more with it! "The impossible dream" from Man of La Mancha revealed an excellent facility with English but was plagued by the same lack of variety noted in the Thomas aria. Obviously Russian songs (here we must admit to the error of lumping together Russian, Ukrainian, and Georgian) bring out the best in Russian singers. A highlight of the program was Mr. Gvinianidze's performance of "Tolko raz", a sentimental song about longing that was sung with great depth of feeling. This same intensity of feeling was noted in the performance of "Core 'ngrato" by Giovanni Formisano, a tenor with such an Italianate sound that the scent of garlic permeated Zankel Hall! He also wowed us with Federico's lament from Cilea's L'Arlesiana. Speaking of being wowed, we took great pleasure in the performance of baritone Junhan Choi. This artist impressed us with his sincerity in every role he sang. There was no trace of "showiness" but rather a dedication to the character he was performing. He made a believable Dr. Malatesta in Donizetti's Don Pasquale, singing the duet "Pronto io son" with soprano Olga Lisovskaya, who kept trying on faces and gestures with which to convince the titular character that she was an innocent convent girl. He absolutely shone in the warhorse "Largo al factotum", bringing new life to an overheard aria, showing a lot of personality and variation in color. Some of the embellishments sounded original to our ear and the tongue-twisting patter moved briskly along. Ms. Lisovskaya is not only a wonderful singer but also a director, teacher, and producer, serving as director of Talents of the World. She made an excellent host for the evening and made a brief appearance as Oscar in a scene from Verdi's Ballo in Maschera in which Mr. Melo used his gorgeous instrument to portray Riccardo's anguish over his illicit love for Amelia. Mezzo-soprano Nino Surguladze made several appearances, all of them excellent, giving evidence of her versatility. She made a fine Dalila, seducing Samson in "Mon coeur s'ouvre à ta voix" from the Saint-Saëns opera. There was a lovely decrescendo to an almost whispered pianissimo, a distinctive timbre to her voice, and variety of dynamics that contributed to a highly expressive delivery. We had never heard of El Salvadorean pianist William Gomez and we will be ever grateful to Ms. Surguladze for introducing us to his arrangement of "Ave Maria". The lovely melody sounds nothing like other contemporary music but neither does it owe anything to the Schubert setting. The sound of Spanish fell on the ear gently. There is even a humming section! Her duet with Mr. Gvinianidze--Albinoni's "Adagio" was lovely. Soprano Anni Kolkhida performed "Vissi d'Arte" from Puccini's Tosca, creating a nice spin in the upper register but not exhibiting enough breath support in the middle and lower parts of the register. Her dramatic skills emerged in "Mira, d'acerbe lagrime", her duet with Count di Luna (Mr. Gvinianidze) in which she tries to save the life of her lover Manrico. The pair also did well in Vincenzo Di Chiara's isolated hit song "La Spagnola". There was also a strange iteration of Robert's aria from Tchaikovsky's Iolanta performed by Mr. Gvinianidze, Mr. Kyreiev, and Mr. Choi! Not bad, just odd. Whenever you get a soprano, a mezzo, a tenor, and a baritone in the same room, you just know you will get the final quartet from Verdi's Rigoletto. And we did. Mr. Formisano sang the Duke, Ms. Lisovskaya sang Gilda, Ms. Surguladze sang Maddalena, and Mr. Kyreiev sang Rigoletto. The two pianists for the evening were Alexandra Naumenko and Victoria Ulanovskya, who played an improvisation dedicated to Mr. Hvorostovsky entitled "The world is empty without you". We miss Dima and he is not replaceable, but our world will never be empty as long as there are singers and songs! The proceeds of the concert will go to organizations researching childhood cancer, a superb way to honor an artist who gave many concerts to benefit children in need.